What Is a Fire Alarm Box? 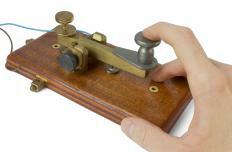 During the 1850s, telegraphs were commonly used to contact emergency workers. People need to alert their local fire department whenever there is an emergency, even if power and telephone lines are inoperable. A fire alarm box is one way of doing so because it has its own power source that is independent of major electric companies. This device contains a lever that is pulled in the event of a fire, creating a telegraphic message for the fire department. Each unit contains a unique number which is tracked by the fire department in order to pinpoint the location of the fire. It is normally a bright red box attached to a telephone pole in residential neighborhoods, most often in the eastern United States. The practice of using a fire alarm box for communication dates to the 1850s. During this time, the use of telegraph machines was becoming commonplace throughout much of the U.S., and this technology was widely embraced as a method of contacting emergency workers. This trend continued to increase throughout the first half of the 20th century, but during the latter half, telephones became more widely used to report fires. As a result, many cities abandoned the use of fire alarm pull boxes, even though they are still popular in the state of New Jersey. A fire alarm box is a rectangular device around eight to ten inches (20.32 to 25.4 cm) long and six inches (15.24 cm) wide that somewhat resembles a birdhouse. It is usually painted bright red and has large white letters spelling out the word "fire" on either side. The box is normally hung on the side of a light pole and is placed three to four feet (0.92 to 1.22 m) off the ground so it can be easily accessed. There is a lever in the center of the box that is pulled down whenever there is a fire, when then this sends a telegraph to the nearest fire station. Each fire alarm box has its own unique code so that firefighters can determine where the call came from. The disadvantage of this is that the fire department can only pinpoint a general area where a fire has broken out rather than a specific residence. An advantage is that a pull box operates on power from a battery or generator, so it can be an effective means of communication even if electric or telephone services have otherwise been interrupted. This unit is costly to maintain, but can help save lives during a terrorist attack or widespread natural disaster. What Is a Utility Pole? How do I Avoid an Attic Fire? What is a Fire Alarm Pull Station? What is a Fire Alarm Panel? How do I Choose the Best Residential Security Systems?